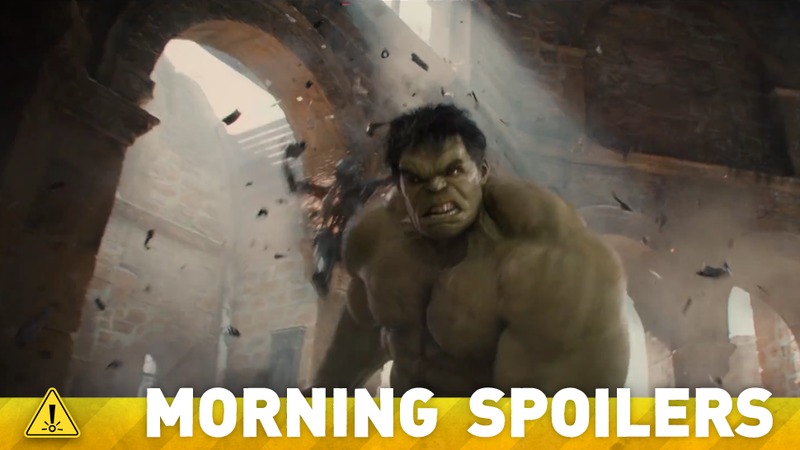 Joss Whedon explains why there's "way more Hulk" in Avengers 2. Mike Colter talks about playing Luke Cage in AKA Jessica Jones. Just how successful was Coulson's gambit in the last Agents of SHIELD? Norman Reedus re-opens the discussion surrounding Daryl's sexuality on The Walking Dead. Spoilers, ho! They're very disparate characters. The joy of the Avengers is they really don't belong in the same room. It's not like the X-Men who are all tortured by the same thing and have similar costumes. These guys are just all over the place. And so it's tough. Honestly, this is as though as anything I've ever done, and I haven't worked this hard since I had three shows on the air. "There is more Hulk in this movie than there was in the last," he said. "[W]e went in with this mission statement, to shoot the Hulk like a character in a movie, and not like a 'Look what we've got!' We have 'overs' – blurry 'Hulk's over there! Bits, very quick shots. Everything isn't 'We built the Hulk so for god's sake you're going to watch him in this long take, full frame, the whole time!' We really got to make him one of the characters in the movie. And that was a gift." Here's an AP video showing filming of a car chase in Rome. "It's geared towards an adult audience, which is something that will be different from the Marvel Cinematic Universe that you've seen before on the big screen," says Colter. "I'm excited about playing the character because I've read the comic books. They're very detailed, gritty; the world they've written in the comic books is very clear. Marvel does a fantastic job about bringing human stories – because you're telling big stories with a heart at the center of it – and that's what connects all of the characters to our audience members." "I'm a black male who's playing a character who has historically been black," he declares. "The approach with the character for me is more about the human qualities and the things that make Luke Cage tick. And the writers have to then decide to bring in the race of the character, if there's an angle there. But I don't look at it as something I have to prep differently for, because I am what I am and I approach the characters as they have to then be played by me, Mike Colter – the actor who happens to be black. It's more of an aside, rather than something I take on by the horns. It doesn't really factor for me at all." "Hydra's always been played as — or at least we've been playing it in modern times as — they're almost like cells and there's a lot of them and as they always say, you cut off one head and many more grow," said executive producer Jeph Loeb. "In our mind, this was an impressive feat Coulson pulled off, but it doesn't necessarily mean that Hydra is done." "Will they ever be done?" wondered executive producer Jed Whedon. "Their logo's too cool to ever go away." Jonathan Pryce, who plays the High Sparrow this season, says that he was happy with this role because his character is influential and makes an impact on the story: "I remember starting out and my agent said 'does the character change the situation or is he just a functionary' and this character changes the situation." "I read the script and some of the others had to, but I know one actor who hadn't read the script and he didn't know what was going to happen to him," Pryce said. "He died and he wasn't happy." "suddenly got a whole new bunch of people to feel intimidated by, and frightened of. And a whole new bunch of people to feel inferior to. With Stannis being such a war leader, such a military tactitian, in the same way [Samwell's] father was, I think that [Stannis] is going to come into Castle Black, where [Samwell's] been protected from that. And he's going to bring in a lot of the feeling that Samwell had towards his father.... Samwell's going to get knocked down a few pegs by Stannis." Season 3's 20th episode will be called 'The Fallen' - perhaps in reference to a character's exit in the previous episode, as hinted by the cast recently? Still weighed down by his last meeting with Ra's al Ghul (guest star Matt Nable), Oliver (Stephen Amell) returns home to find a new villain and his crew have started terrorizing Starling City - Michael Amar AKA Murmur (guest star Adrian Glynn McMorran), a man whose mouth has been sewn shut. Meanwhile, Laurel (Katie Cassidy) and Nyssa (guest star Katrina Law) bond over their issues with their fathers and Nyssa make Laurel an offer. Thea (Willa Holland) is forced to come to terms with her father after Oliver brings Malcom (John Barrowman) to the loft to recover, and Lance (Paul Blackthorne) shuts out both Laurel and the Arrow. Jensen was photographed wearing the same red over shirt from the final scenes of 10x10; set photos show a hooded figure in green and a man with a chalice outside a church. This may be a light episode for the boys, and Dean especially may be separated from sam and cas for a great deal of it. Cas and Sam perform a seance of some sort. Cas may be in this episode. As rowena is in this episode, Crowley is likey going to be in this episode as well. Some shooting was done in a library set. Shooting was done with Jensen in the same woods location the use used for purgatory. Interior shooting was done with Ruth and Jared. COLE PAYS A VISIT TO THE WINCHESTERS — Despite Dean's (Jensen Ackles) directive to forget about looking for a cure for the Mark of Cain, Sam (Jared Padalecki) continues to do research. Dean suspects Sam is hiding something but decides to focus on a new murder case where they run into Cole (guest star Travis Aaron Wade). The three team up and learn a Khan worm is infecting men and turning them into murderers. Unfortunately, the worm makes it's way into Cole.